And here's my latest book trailer for an AMAZING read!!!! Sabara, the queen knows she's losing her grip on her world. She has to fight the Resistance, who wants to overthrow her, but more than that, her body is giving out on her. She needs a replacement, a royal whom she can transfer into. There's rumor of one, and she's put her grandson, Max, in charge of finding this rumor. He can't let her down...she needs this one. Soon the city Charlaina lives in and Sabara rules become chaotic, with the underground Resistance bombing buildings and destroying lives. Charlie, along with her best friend Brooklynn and Aron, watch as their lives are ripped apart. But is this being done for the right reasons? When Charlie is in the crosshairs of both factions, which will she trust? Derting's first dystopia novel blends in fantasy in a society struggling to stay alive. Charlie is a strong female character whose responsibilities far surpass those of a typical teenager but her emotional struggles are all too real. Seen from different viewpoints, with most of those being Charlie, helps the reader understand the full spectrum of the world Charlie lives in without being lost in the plot. This mixed genre will please readers of both fantasy and dystopia and is pitched well on both sides. 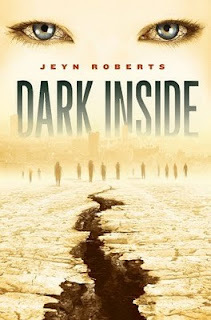 Derting makes an excellent transistion from her mystery novels into dystopia. Fans familiar with her Body Finder series will find her newest novel equally enthralling! It was just the beginning of an ordinary day for four teens in different cities, in different states and provinces. But it wouldn't take long for their lives, and the lives of everyone they know, to change. What started as violent earthquakes that began to shake their lives turned into a living nightmare they escaped from. Aries, Mason, Clementine, and Michael don't know each other. There's no communication, no electricity, so they have no way of knowing how extensive the catastrophe is. All they know are the horrors that are lurking out there, waiting for them. They know it's a killer's spree that dominates the real world now. Something happened when the earthquakes started, and people who were good and decent are now psychotic killers, participating and enjoying the thrill of the hunt and kill. They're called Baggers, and their prey are other humans. You can tell a Bagger because of their eyes...the veins are black and what's hiding behind them is even darker. Baggers aren't monsters physically, but they are psychologically, creating, without prejudice, acts of violence against anyone from lynching to stabbing to shooting...the list goes on. Now all four are on the run trying to save their lives. They hide from the Baggers and try to find others who haven't been "touched" by this virus (or is it?) and continue to fight another day. All around these teens is chaos - fires burning, bodies laying wasted on the ground, scavengers looking for a place to stay, terror. It will take fortitude to propel them further, if they can make it. What they don't know is that this dark nothing, this evil that has invaded humanity, may be lurking within the circle of trust they've relied on in order to survive. Can someone repel this evil Nothing, or will it eventually take over and create a Judas in Aries, Mason's, Michael's and Clementine's groups? Is it safer to work together or be alone?